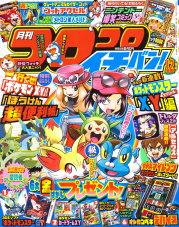 Pocket Monsters Special XY Volume 01 was released in Japan on April 28th, 2014. Years ago, a young boy named X won a junior tournament with his Garura. The press became obsessed with him, calling him a prodigy and saying that he has what it takes to become a great trainer, but all this attention ended up driving him to seclusion. Years later, X remains holed up in his room in his house in Asame Town. 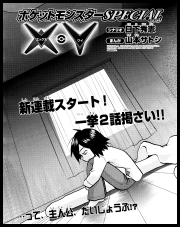 His friends - Y, Sana, Trova, and Tierno - have been showing off things like Poffres and Super Training to coax him into stepping out of his room but nothing's worked so far. Two journalists, Pansy and her sister Viola, stop by X's house to interview the young trainer but Y steps up and chases them away. Just then, Trova receives a message telling him that the three starter pokemon he had ordered have arrived! Trova figured that, when presented with either Fokko, Keromatsu, or Harimaron, X will get so excited that he'll snap out of his depression. Suddenly, and without warning, the legendary pokemon Xerneas and Yveltal appear in the skies above Asame Town! The pokemon begin to rampage about the town, all while X remains in his room alone with a shining bracelet on his arm. Sana's nickname for Tierno is "Tierun" (ティエるん). Her nickname for X is Eppi (エッP). 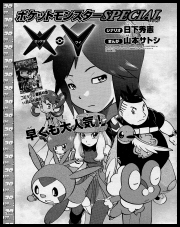 X's Garura is nicknamed "Garu" (ガル). The baby inside Garu's pouch is referred to as "Kogaru" (コガル). At this point it is unknown if this is the pokemon's nickname or if it's just a handy way to refer to Garura's baby. 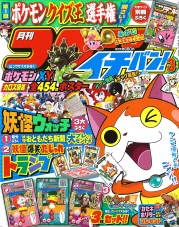 Y's full name is revealed to be Y na Garbena (ワイ・ナ・ガーべナ). Her nicknames are "YP" (ワイＰ), used by Sana, and "Y-chan" (ワイちゃん) by everyone else. X peers out his window and sees the legendary pokemon causing havoc over the streets of Asame Town. Below, Y hops onto her Saihorn and has it take her and the rest of her friends to safety. Meanwhile, Xerosicy, Correa, and Bara, three scientists of an organization known as the Flare-Dan, look on at the destruction of the legendary pokemon. They need the power of at least one of these ferocious beasts in order to power their "ultimate weapon" but decide that there's no way they have the manpower to bring either one of them in at this point in time. As they prepare to retreat they detect a Mega Ring somewhere in town. They're eventually led to X's house where they engage the young trainer in battle. His Garura steps in to lend a hand and, after seeing its trainer in trouble, uses the power of X's Mega Ring to transform into Mega Garura! The Mega Evolved pokemon makes quick work of the Flare-Dan's team, forcing them to retreat. Later, after Xerneas and Yveltal have left, Y and the others look over the wreckage of their hometown. They decide to set off to report what just happened to Platane-Hakase. Sana: Her Trimmien was blown away during the chaos. She wants to travel so she can look for it despite the fact that moving away from Asame Town is probably not the easiest way to find it...? Trova: The Fokko and the Pokemon Zukan that was sent along with it by Platane-Hakase got lost during the legendary pokemon's attack on his hometown. His Holocaster also lost the ability to send e-mails. Tierno: His beloved Dance School was destroyed. The sun is starting to set so our heroes have made a reservation at an inn in Meisui Town. X remains outside on his cart, Y stays in the lobby and attempts to check in on her mother, and Sana, Trova, and Tierno go ahead up to their room. Outside, X wonders about the connection the ring on his wrist has to the power up his Garura received during its battle back in Asame Town. Later, Tierno comes outside and shows X the Keromatsu and Harimaron that Trova got from Platane-Hakase. He then tells his friend that he should focus on repairing his relationship with Garura and then start over as a Pokemon Trainer before returning to his room for the night. The old woman who runs the inn sees that X is finally by himself and contacts her colleagues in the Flare-Dan to attack! Y quickly rushes outside but is too late; Akebi and Momiji are already running off with X's Garura! Y asks the Harimaron and Keromatsu that Tierno brought outside to help her as the Flare-Dan scientists attack. The commotion from the ensuing battle causes X to finally come out from hiding and confront his pokemon's abductors. 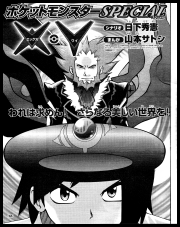 X touches his Mega Ring to initiate Garura's Mega Evolution...but nothing happens! A desperate Y looks over at the boxes Tierno brought the starter pokemon out in and notices two Pokemon Zukan sticking out. She takes one to look up what attacks Harimaron and Keromatsu can use but the Flare-Dan's Horudo and Hellgar strike before she has a chance to do anything. Suddenly, X comes running forward with the other Pokemon Zukan in his hand and orders Harimaron to block one of Horudo's incoming punches with its head! Harimaron then runs up the side of the inn and tricks Horudo into punching a hole into the wall that enables Trova and the others to escape. As our heroes make a run for it, Harimaron uses Pin Missile to pin Akebi and Momiji to a nearby tree. 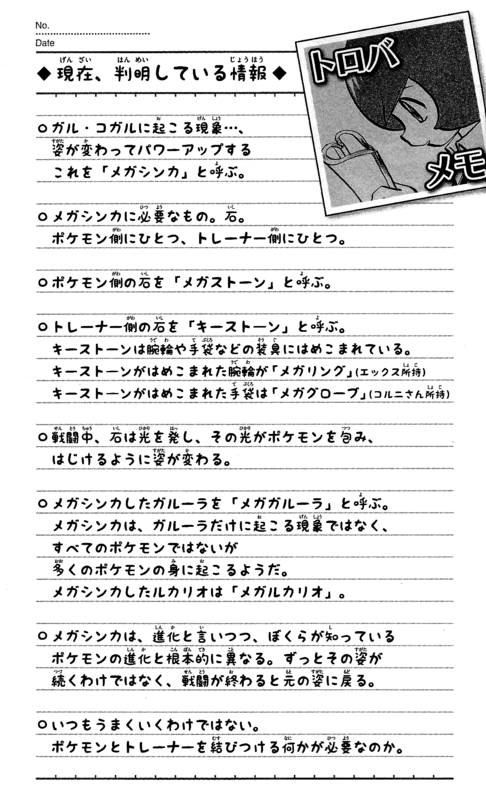 Later, in a camp outside town, Tierno tells X that he should let Harimaron join his team but X declines. Later, Trova discovers a Mega Stone inside Garura's pouch and wonders what connection it has to the stone on X's so-called "Mega Ring." Over in Miare City, Platane-Hakase shows a video Trova had sent of the attack on Asame Town to his friend Fleur-de-Lys. Fleur-de-Lys notices that Yveltal has the power to steal life and Xerneas has the power to give it and requests a copy of the video be made so he can study it further. Meanwhile, our heroes have arrived in Hakudan City. There, Y presents everyone with a set of precautions she wants everyone to start taking: don't go off with strangers, don't give out your real name, don't use any telephones, etc. 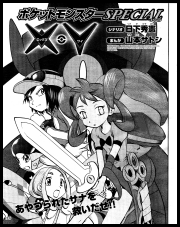 Later, our heroes leave the city and try to recreate the series of events that enabled X's pokemon to Mega Evolve, hoping to find a way to trigger the transformation at will. Suddenly, the group is approached by Viola, the camerawoman they saw back in Asame Town! 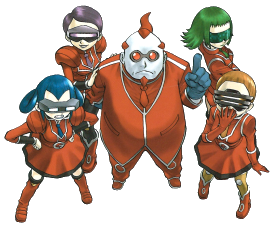 She reveals that she's the Hakudan City Gym Leader and invites everyone back to her Gym to look at the recordings she made of the attack on Asame Town. Sana protests, however, saying that this exactly the sort of thing Y was warning them about! She later meets a Trimmien Trainer and is given an impromptu lesson in pokemon grooming, unaware that the whole thing is a set-up to allow a Gilguard owned by the Flare-Dan to take over her mind. 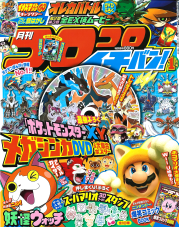 X and the others have arrived in Hakudan City! 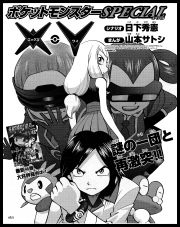 X battles with Viola, who turns out to be the local Gym Leader, while the others look through the photos she took of the Asame Town incident. Y, meanwhile, goes back out into the city to look for Sana. She eventually finds her friend but notices that she doesn't seem to be herself. Later, X defeats Viola and reveals that he developed a strategy to counter a pokemon's Supersonic attack during the Junior Tournament he won years earlier. He then segues into the story of how he received his Mega Ring from a mysterious stranger. That night, our heroes are sleeping at the Gym when Y and Viola catch Sana stealing the Key Stone inside Garura's pocket! Sana turns toward her friends and uses the strange sword she had been carrying around with her to strike down Viola! Just then Correa of the Flare-Dan shows up and reveals that the sword Sana's carrying is really a Hitotsuki and that they've been using a Gilguard to control Sana's mind! X and the others eventually manage to move the battle outside where an unknown woman and her Mega Lucario come to their aid. Mega Lucario's Trainer, the Shala City Gym Leader Corni, jumps onto the scene and orders her pokemon to attack Correa's Gilguard. 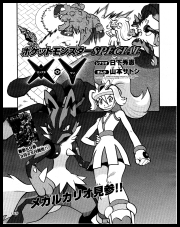 She soon notices that none of its attacks are having any effect on her Ghost-Type opponent and so she decides to help X retrieve Garura's Key Stone. Corni distracts Correa with some fancy rollerskating moves while X tries to sneak up behind her and grab the stone. His attempt fails but -does- force Correa to jump backwards, landing her right into a web that Viola's Ametama had been creating in the meantime! Kogaru is able to retrieve the Key Stone from the immobilized Correa, allowing it to transform into Mega Garura! During the battle that ensues, Corni finds out that X didn't go through the "successor ceremony" in order to obtain his Mega Ring and instead received it from her grandfather Concombre! Correa eventually retreats, realizing that she's no match for two Mega Evolved pokemon. Later, Sana comes to and apologizes to everyone for all that she's done. Corni then approaches X and tells him that she has no idea why her grandfather gave him the Mega Ring but that she refuses to recognize him as a true "successor." 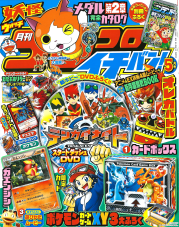 The phenomenon where Garu and Kogaru transform and power up is called "Mega Evolution." What's needed for Mega Evolution: Stones. One that the pokemon has and one that the Trainer has. The stone that the pokemon uses is called a "Mega Stone." The stone that the Trainer uses is called a "Key Stone." Key Stones are set in items that you wear like bracelets and gloves. A bracelet with a Key Stone set in it is called a "Mega Ring" (like what X has). A glove with a Key Stone set in it is called a "Mega Glove" (like what Corni has). During battle, light comes from the stone, surrounds the pokemon, and causes their shape to change in a huge burst of light. 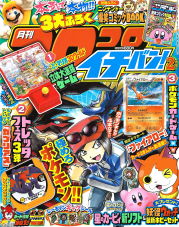 The Mega Evolved Garura is called "Mega Garura." Mega Evolution doesn't occur with just Garura but it doesn't happen with every single pokemon out there either. It does seem occur with a lot of them, though. The Mega Evolved Lucario is called "Mega Lucario." Mega Evolution, despite its name, is fundamentally different from the pokemon evolution that we know. The pokemon doesn't remain evolved indefinitely and instead reverts back to its original form once the battle is over. It can't just happen at any time. Maybe there needs to be something connecting the pokemon and its Trainer? 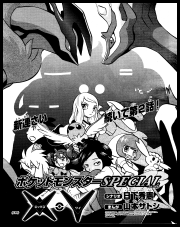 This concludes Pocket Monsters Special XY Volume 01. 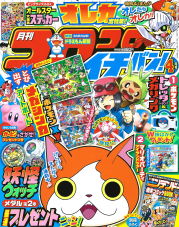 The story continues in the pages of CoroCoro Ichiban! and Pokemon Fan!